Started with Engineering, a well established metal pressing and fabrication factory in Mumbai since 1979. Brother Shri Jayant Churi joined in 1982, worked together till 1998, later handed over to Brother in 1998 and joined as consultant to Nisarg Nirman. Then joined as Managing Director with Nisarg Nirman Agro Products Pvt. Ltd., formed in 2005. It was at Anjali's insistence that they purchased, first land at Bordi, Stn. Gholvad, Tal Dahanu, Dist. Then Thane, Now Dist. Palghar, in 1991 with brothers and started their farming with asparagus. Then for more production, research purchased more land at Aware, Tal. Shahapur, Stn. Asangav, Dist Thane, in 1999. Working closely with various Social & Business Organisations on various positions. 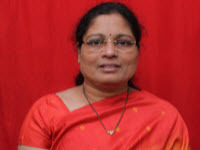 Anjali's father Mr. Bhalchandra Patil was working as a teacher in the Krishi Vidnyan Kendra at Kosbad, Dahanu, Dist. Thane. 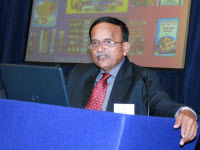 Anjali often accompanied him and had first hand feel & experience of the pioneering research that he did on Asparagus. Started production of Asparagus at Bordi farm, As a result, became a pioneer in growing asparagus successfully throughout the year in 1992. Started supply on small basis to Tajmahal, Oberoi & President Hotel. Formation of proprietory company Nisarg Nirman in 1997. Formed Nisarg Nirman Agro Products Pvt. Ltd., in 2005. Has grown up watching her parents build Nisarg Nirman from scratch. She is a graduate holding Bachelor's degree in Biochemistry and a Post Graduate Diploma in Family Managed Business Management. Diploma holder in food control and quality assurance. Course in Bakery at Institute of Hotel Management, Catering Technology & Applied Nutrition, Dadar. 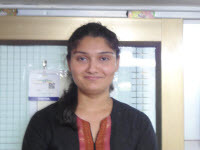 She has also worked as trainee - quality assurance analyst with TAJ SATS, Air Catering Ltd.